Moisturizers vs. 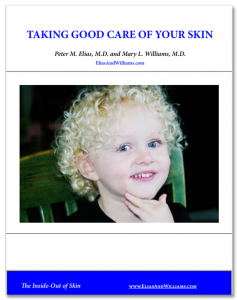 Barrier Repair Lotions and Creams - Elias and Williams: The Inside-Out of Skin by dermatologists and skin researchers Peter M. Elias, M.D. and Mary L. Williams, M.D. 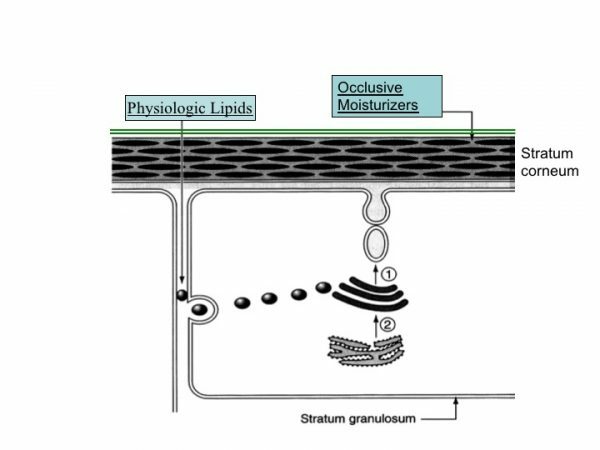 Diagram showing different fate of moisturizer vs barrier repair lipids. From: Elias PM and Sugarman J. Ann. Allergy Asthma Immunol. In Press, 2018. Moisturizers vs. Barrier Repair Products: Are They The Same? Some products for dry skin call themselves ‘moisturizers’, while others are labeled ‘barrier repair’. Moisturizers vs. barrier repair lotions and creams: are they really the same thing? If you have ever stood in front of a pharmacy shelf looking for something that could fix your dry skin, chances are you might have been a bit confused. Perhaps you felt unsure which one of the dozens of lotions and creams on the shelf before you is the right one for your skin. In essence, a good moisturizer will treat the symptom – ‘dry skin’ – while a good barrier repair product will treat the disease – a defective skin barrier which was producing ‘dry skin. Although both moisturizers and barrier repair formulations can be considered appropriate for the treatment of dry skin, they do address somewhat different therapeutic goals. Moisturizers aim to rehydrate the outer layer of skin – the stratum corneum – while barrier repair agents attempt to restore the skin barrier. If they are successful in repairing the barrier, they will be correcting the defect that caused the skin to be dry in the first place. Moisturizers are the most common products on pharmacy shelves for the treatment of dry skin. Most often, dry skin is caused by a defect in the skin barrier. As the outer layer of skin (the stratum corneum) becomes leaky, their cells (‘corneocytes’) are unable to hold onto their water – the corneocytes dehydrate. Most moisturizers act by depositing a layer of grease (‘lipid’) on the surface of the skin, which can act as a temporary seal to hold in the water inside the cells. But as soon as they wear off, water again can leak out, and the cells quickly dehydrate again. Dermatologists often recommend the use of a cream or ointment moisturizer for the treatment of dry skin, rather than a lotion. This is because creams and ointments provide a thicker layer of lipid sealant that can provide a longer lasting moisturizing effect. But caveat emptor: Recent work from our laboratory shows that many of these products are actually harmful to the skin. While they may temporarily moisturize the skin, they can actually make the underlying skin condition worse. Barrier repair products are relative newcomers to the pharmacy shelves. They, too, are based upon lipids. One big difference between these products and moisturizers, however, lies in the type of lipids they provide. Moisturizers typically are made up of lipids that are not natural to skin. You can think of them as ‘outsiders’. When applied to the skin, they mostly sit on the surface – until they wear off. Barrier repair products use lipids that are the same as, or close relatives of, the lipids that the skin itself produces for the barrier. They are ‘family’ or in scientific terms, ‘physiologic’ to the skin. When these products are applied to the skin, their ‘family friendly’ lipids percolate through the stratum corneum, enter the living epidermal cells below, where they intermingle with the native lipids that the epidermis is producing. These family friendly visitors are then packaged together with the native lipids, and secreted out of the living cells and into the space between the cells of stratum corneum. Once there, they can form new membranes and thereby generate a water barrier. A caveat emptor warning also applies to barrier repair products. ‘Barrier repair’ is often used as a buzz word. It can be a marketing ploy without substance in fact. Manufacturers are not required to demonstrate that these formulations actually do repair a damaged skin barrier. Many, as our research has found, do not fulfill their promise. This could be because their family-friendly lipids are not present in sufficient quantity to have the desired reparative effect. Or it could be because the balance of family lipids in these products is incorrect. For ‘physiologic’ or, as we are calling them here, family-friendly lipids to be effective, all 3 of the key classes of barrier lipids must be present in the formulation. In other words they most contain not only ceramides, but also fatty acids and cholesterol. In addition, the 3 classes must be in the correct proportions to each other, the right balance, in order to form normal membrane structures. For example, if you flood the system by applying a barrier repair cream that only contains ceramides, this boat load of ceramides entering the epidermal cell will not be matched by an equal proportion of native cholesterol and native fatty acids. And when this mismatched pool of lipids is secreted, they will not form membrane structures; instead the lipids separate into globs or droplets that distort the membranes around them, therby providing a pathway for water to leak outward. EpiCeram® is a barrier repair formulation developed in the Elias laboratory, which provides both sufficient quantities and a balanced mixture of physiologically based lipids. EpiCeram® has been demonstrated to be effective in repairing the barrier in children with atopic dermatitis.